Compared to a traditional acoustic guitar such as Carolan, NIMEs are an unusual bunch, mixing physical controllers, with sensors, actuators and software to create highly innovative instruments. NIMEs range from traditional instruments that are augmented with digital technologies to radical, bespoke and often highly personalized instruments. A lovely aspect of the conference is balancing a programme of concerts with a program of academic talks so that we get to see many NIMEs in action as well as learn about how they are put together. 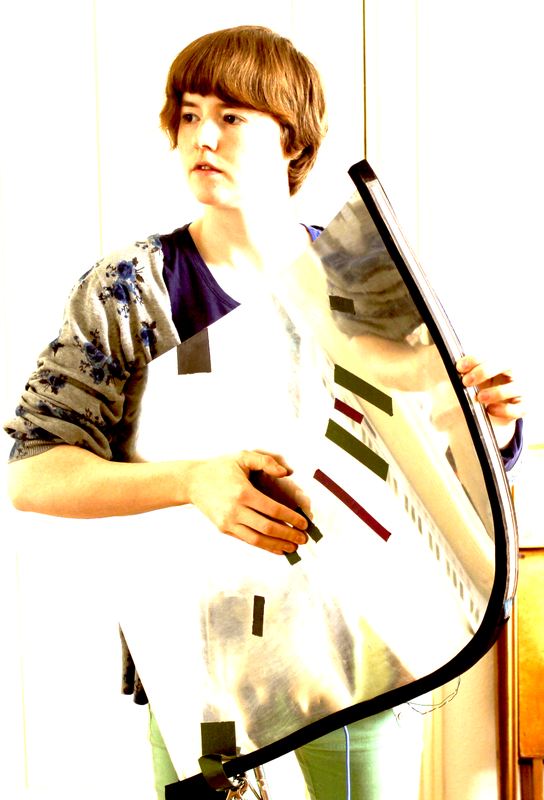 There is Dianne Verdonk’s La Diantenne 2.0, a beautiful a harp-like instrument fashioned from tin plate that uses a contact microphone to produce sound in response to flexing, touching, stroking and percussive striking. Dianne’s paper explains how the instrument is also designed with the visual aspects of performance in mind. We’re struck by how her design separates front from back surfaces with the result that manipulations may be either revealed to or hidden from audiences, creating interactions that are ‘expressive’ or ‘magical’ to use the terms coined by Stuart Reeves in his paper on designing the spectator experience. Then there is Myriam Bleau’s Software Revolvers, a performance of four spinning tops that control both music and in-built lighting to deliver a mesmerising performance that conveys the energy required to strive to build and maintain a beat. We’re excited to attend our first performance of ‘live coding’ in which sound-generating computer code is written live on stage in front of the audience. David Oborn and Shawn Mativetsky’s performance ‘A Very Long Cat’ is especially impressive for combing live coding with impressively fast tabla playing over a long-distance network link. Great music and something of a technical tour de force. Away from the performances, it’s possible to encounter more NIMES at the interactive poster sessions. Among the more unusual and provocative are Woomba that plays music to and also responds to the moveme nts of an unborn child; PHOX Ears, ‘A Parabolic, Head-mounted, Orientable, eXtrasensory Listening Device’ that extends and distorts normal human hearing through steerable reflectors mounted on a hat and Puff, Puff, Play, an experiment into controlling a music player by sucking on a wooden pipe. Given this company, is Carolan really a NIME? It’s not clear. Although not (yet) digitally augmented for performance, Carolan is digitally augmented to retell its history, an idea that might be applied to all manner of NIMES such as the D-Boxes that we met back in Post 42 and that are also present at the conference (we took part in a full-day workshop on hacking D-Boxes at the conference). Somewhat surprisingly, Carolan does get to meet a fellow Celtic NIME – a set of digital bagpipes that have been developed by Duncan Menzies of the Augmented Instruments Group (also home to those D-Boxes) at Queen Mary as part of his PhD. These pipes feature a custom-built digital chanter that uses infrared reflectance sensors mounted inside the holes of a cylindrical chanter shell to detect the continuous movements of the player’s fingers. The result is a set of electronic pipes that are highly responsive, that can be played at any volume, and that also capture players’ finger movements as a digital record so that they can analyse their playing, for example their ornamentation, later on. You can read more in Duncan’s paper. We can’t resist a wee Scottish session and so here is a first run through a couple of tunes, the jig Mrs Lily Christie (by Pipe Major Donald Shaw Ramsey) and the reel The Fourth Floor (by Gordon Duncan). With a full ten minutes of intensive rehearsal behind us, we sign up for NIME’s Open Mic session later that evening at the Varsity Theatre. We’re certainly not the usual NIME fare which tends towards the contemporary and experimental, but we’re NIMES at NIME and so its great to play anyway. And there’s always someone up for a session wherever you find yourself! And here’s an image of some of the data captured from Duncan’s pipes. He’s chosen four bars from the the open mic performance where (he says) the software revealed various aspects of ornamentation to be worked on. Apparently, the red blocks are false fingerings (meaning some holes wrongly covered/uncovered in the bottom hand) and the red circles are poor transitions known as “crossing noises”. 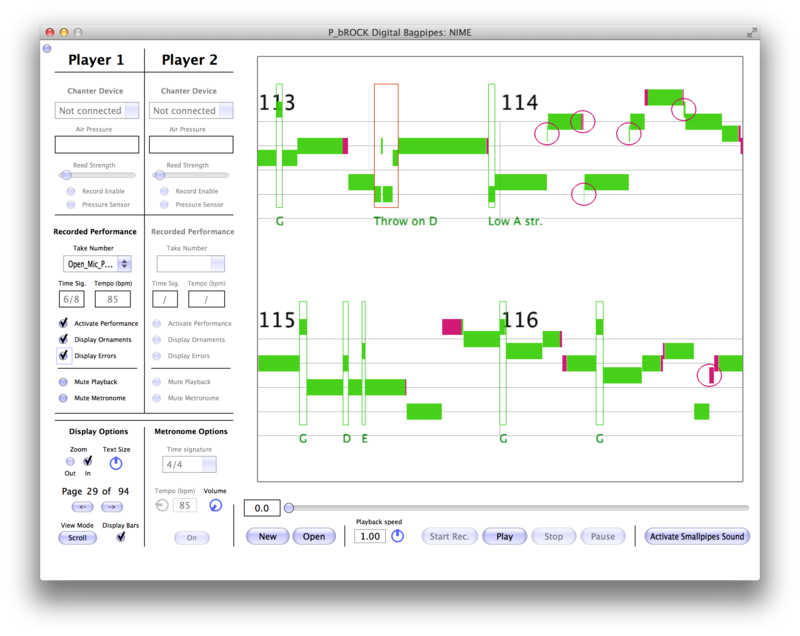 I can’t say that we noticed these in the performance, but what a fantastic tool for the serious musician to have to be able to document and analyse their playing. Surely, this is an aspect of NIMES that could be added to many mainstream instruments in the future? Reblogged this on Adrian Hazzard.